This move and similar steps taken previously by France and now possibly Canada to make boycotts of Israel illegal are at best illogical but, most worryingly, send a message to Israel that only it can determine whether to end the occupation and when. The tools to put civil society pressure on it to do so without delay are being stripped away. The attacks on those responding to and promoting the BDS call are illogical. Since the occupation is not a static beast, the longer that it goes on, the less chance there is of realising a two-state solution, which is what each of these countries claims is its national policy. Their actions thus far to convince Israel to halt its illegal settlement activity and end the occupation have amounted to nothing. 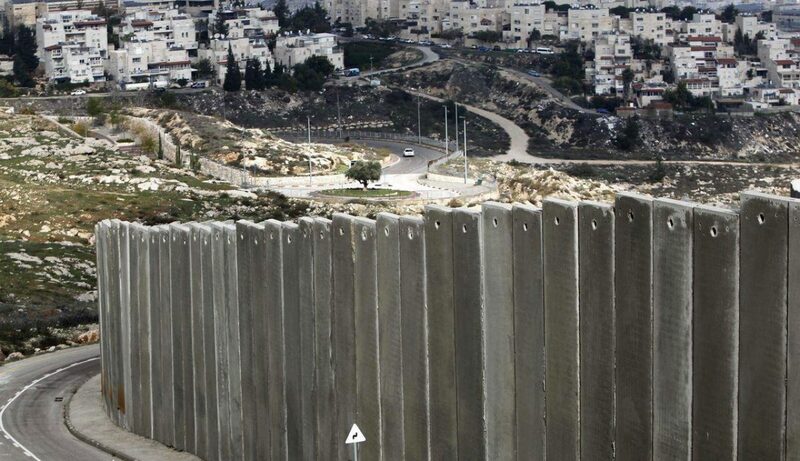 The number of illegal settlers has reached 650,000 in the West Bank, including East Jerusalem. Will they only act when the number of illegal settlers reaches a million, or even more? For its part, the Palestinian Authority has not fully embraced the BDS call, choosing instead to focus on boycotting settlement goods and, even then, doing so intermittently. This goes as far back as 2010 when the then PA Prime Minister Salam Fayyad was seen tossing settlement products onto bonfires. However, away from the cameras there has not been a sustained effort to enforce a boycott to the degree that it has hurt the settlements. 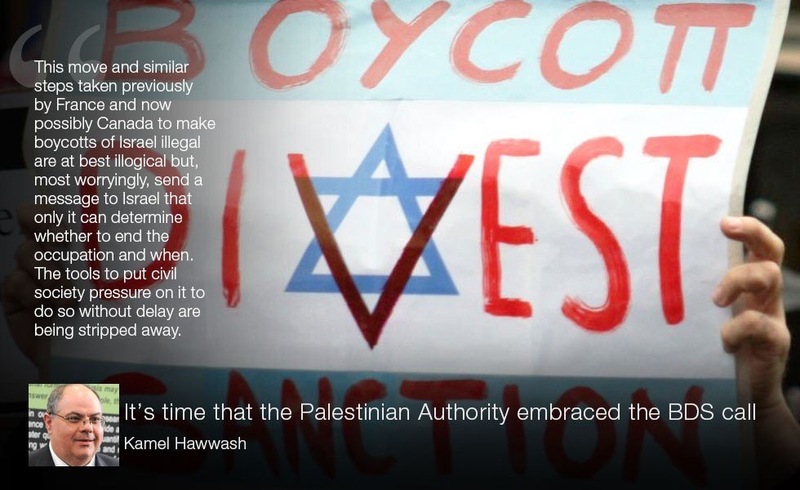 In fact, President Mahmoud Abbas has been explicit in refusing calls for expanding this modest action to a full boycott of Israel in line with the BDS call. In 2103, he famously chose a trip to South Africa, of all places, during which he rejected the BDS campaign in the country. “No, we do not support boycotts of Israel,” he said, “but we ask everyone to boycott the products of the settlements because the settlements are in our territories. It is illegal.” This caused outrage among Palestinians and their supporters despite a clarification issued later by the Palestinian Embassy in South Africa. Just over two years after Abbas’s statement, the Palestinians find themselves not only in a worse position on the ground but also almost abandoned by their Arab allies, and with Israel succeeding in convincing its allies to attack supporters of the BDS movement and refraining from any peace initiative not to its liking. The most recent example was Israel’s rejection of the French efforts to convene a peace conference to breathe life into the dormant peace process. The Palestinians therefore need to take the initiative. The PA’s insistence on pursuing an end to the occupation through peaceful means is not utilising its most successful tool, which is BDS. This peaceful means of putting pressure on Israel is home-grown. The call came from Palestinian civil society in 2005. Its aims are explicit, moral and legitimate, calling for an end to the occupation, equality for Palestinian citizens of Israel and respect and promotion of the right of return for Palestinian refugees. Considering Israel’s intransigence, actions on the ground and the death of dozens of Palestinians, mostly youngsters in the current uprising, it is time that the BDS call became the call from both Palestinian civil society and the Palestinian Authority. This should happen alongside a sustained campaign to discourage Palestinians from working in the illegal settlements before moving on to a complete ban. This acknowledges the difficulty of immediate implementation but at least indicates the direction of travel. It would also send a clear message to the international community that without a peace deal and with no protection for Palestinians from Israel’s murderous actions and continued land theft, the people of Palestine are united in calling for an escalation of BDS as a peaceful resistance tool alongside the internationalisation of the conflict and the pursuit of war crimes trials in the International Criminal Court. After nearly 50 years of the occupation of the West Bank, East Jerusalem and Gaza Strip, and twenty-two years of futile talks, it is time that the Palestinians played their part in delivering on US Secretary Kerry’s warning to Israel in 2014 that should his peace initiative fail, Israel could face “boycotts on steroids”. Professor Kamel Hawwash is a British Palestinian engineering academic based at the University of Birmingham. He is a commentator on Middle East affairs and is Vice Chair of the Palestine Solidarity Campaign. He blogs at http://www.kamelhawwash.com. He writes here in a personal capacity.